If the weather would stay like it is right now I would be perfectly happy. The weekend was absolutely gorgeous and 70 degrees each day. The sun was out and the sky clear. It even made sick me want to go outside to enjoy it for a little while. Saturday while JSL was taking a nap, JL and NHL went outside to get some energy out. It was time to make him run, jump, play and get some sun. 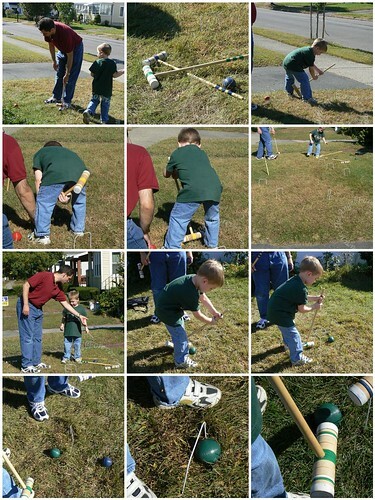 While outside I decided to take some photos of the boys playing croquet. Today the two little guys are home with me. We hope to be able to get outside to enjoy the weather while it is here. The end of the week calls for temperatures barely making it to the 50’s. Talk about a major change! Enjoy the fall while it is here. Yeah, I like smacking things with mallots sometimes too! lol. PERFECT day for croquet! Looks like it was a great father-son bonding! There must be a place where it is 70 degrees all the time. Is there? If you find it, please tell me. Sounds like good weather to me! We’re still hitting the 80s here. Can I join? Looks like fun! Looks like fun! I’m loving this weather too. We have a croquet set but with no flat space in our yard it’s sitting unused in the basement. Alex did cut out a picture of an indoor croquet set for his Christmas list but I wish we could use the outdoor one.